Can you think of a more comforting fall dessert?? I know Thanksgiving is supposed to be all about pies, but if we’re being honest, I’m not a huge pie person. That’s why I created this recipe for pumpkin coconut chocolate chunk bread pudding! These chocolate chip tahini cookies are my new favorites! Buttery with crispy edges, and a hint of sesame flavor paired with bitter dark chocolate! Dress them up with a sprinkling of sea salt to bring out even more flavor. If you love fudgy brownies, these fudgy coconut brownies with chocolate ganache are brownie perfection! Super gooey and moist with tons of chocolate-y flavor! They're really rich, so you'll definitely want one with a cup of milk or ice cream! In charge of dessert for Thanksgiving? Headed to a Friendsgiving potluck? Whip up this vegan pumpkin pie parfait! The bottom layer is a buttery whole grain crust, then topped with creamy pumpkin coconut filling, and served with a dollop of coconut yogurt, drizzle of maple syrup and crunchy toasted pecans! These moist and tender almond butter blondies are the BEST I've ever made. I love them with dark chocolate chips and coconut for a bit of texture. Instead of using flour, this recipe uses almond butter and eggs to create their gooey texture. These little chocolate chip cookie cake bites are perfect for snacking! Packed with coconut, peanuts and chocolate, or use your favorite mix-ins! Hi guys! Another week, another round of guest posts from some of my favorite RD bloggers as I'm off exploring Japan! Today, Rebecca Clyde of Nourish Nutrition Co. is sharing this crazy delicious looking recipe for silken chocolate pie. Her photography is just stunning, so definitely check out her blog, and if you're in the food blogging game yourself, her and another dietitian have recently launched a food photography course. Hi guys! 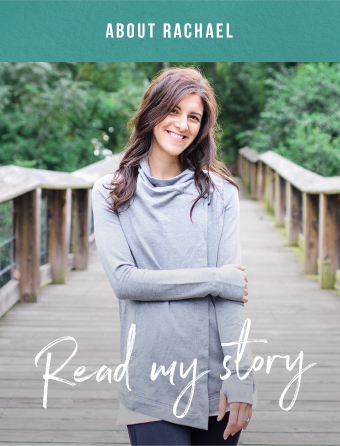 Sharing another guest post today while I'm in Japan, and this one's from the lovely Julie Harrington at RDelicious Kitchen! This cold and creamy frozen yogurt bark with dark chocolate, bananas and hazelnuts makes the perfect cooling snack! These vegan chocolate hazelnut truffles taste like a decadent treat, but are low in sugar and rich in healthy fats, making them perfect for snacking! These gluten free coffee cake muffins are made light and fluffy with coconut flour and studded with chocolate chips and crunchy toasted pecans! Perfect for breakfast or a sweet snack! Meet the greatest thing to happen to you this winter – the hot chocolate ice cream float! This gluten free flourless peanut butter coconut cake couldn't be easier! It's perfectly moist and sweetened with pure maple syrup! Super easy to make and not to sweet, so it's perfect for snacking or dessert! You could also make this with almond butter or cashew butter! These one bowl vegan oatmeal cookies are perfect with crunchy sea salt, or bling them out with chocolate chips, shredded coconut and nuts! Packed with fiber and lightly sweetened, these vegan peanut butter and strawberry jam bars are perfect for snacking or dessert! Hey guys! It's Recipe Redux time so you get a bonus recipe this week! Lucky you ;) And me because it gave me an excuse to try these peanut butter and strawberry jam bars I saw on my friend Alex's blog. For this month's theme we're choosing a fellow recipe reduxer to celebrate by making a recipe from their blog. One of the happiest surprises about starting a blog was just how many real friendships I've made through it. And Alex is one of those people! We "met" after following each others blogs for awhile, I emailed her for advice when I first started my private practice. Actually, I had also emailed Anne too, which makes me laugh because now because the two dietitians I looked up to professionally are my coworkers! Then I feel like a jerk cause I never seem to have enough time to write back all the young RDs and students who send me emails. After emailing on occasion for about a year, we finally got to meet in real life on the California Almonds trip to Lodi, California. We actually came up with the idea for Joyful Eating on our first night over dinner and wine! Crazy to think that it's come to fruition! I hope you check out Alex's blog, Delish Knowledge. She features the most beautifully photographed simple vegetarian recipes. This peanut butter and strawberry jam bar was a recent addition I just had to try. It's part breakfast bar, part cookie, which means you could enjoy it for breakfast or dessert! Preheat oven to 350 degrees. Spray an 8x8 baking dish with olive oil. In a large bowl, whisk together peanut butter and sugar with an electric mixer. Mix in vanilla extract, then flour, oats, salt and baking soda. Stream in almond milk and blend until combined. Place jam in a microwave safe bowl and heat 30 seconds until warm. Spread 3/4 of the peanut butter oat mixture over the bottom of the prepared baking sheet and press down with the back of a spatula. Pour the jam over the top and spread evenly with the jam. Dollop scoops of the peanut butter dough over the jam to make a "crumble" topping. Place in the over and bake 18-20 minutes until set. Remove from heat, let cool, then slice into bars. Have you ever tried pudding cake? This coconut pudding cake bakes with a light and airy cake over a layer of creamy pudding! Apologies for being MIA for so long! Surprise surprise, I've been having more website issues. I won't bore you with the details, other than the fact that this time, I decided instead of panicking and spending all my money trying to get things fixed asap, I decided to wait, do a little research and see if I could get things figured out once and for all. Knocking on wood as I type this (really I am - my husband just gave me a "are you losing your mind?" look because I just knocked on our coffee table), but I think I finally see the light at the end of the tunnel! And we're back with a bang with this coconut pudding cake! I've made pudding cakes a few times and they are just heavenly! By whipping beaten egg whites into the batter, you get a cake that's light and airy on the top with a layer of creamy pudding that forms on the bottom. Preheat oven to 325 degrees Fahrenheit. Spray a 1-quart gratin dish with oil or rub with coconut oil. In a large bowl, beat coconut oil with sugar until creamy with a handheld mixer. Beat in egg yolks, then flour, coconut milk and salt. Rinse beaters clean. Place egg whites in a medium bowl and beat until soft peaks form. Fold in half of the egg white mixture into the yolk mixture until combined, then fold in the remaining half. Pour batter into the baking dish. Place baking dish over a roasting pan. Pour about an inch of water into the roasting pan. Place in the oven and bake 35-40 minutes until cake if puffed and golden. Place on a wire rack to cool for 10 minutes. While cake is baking, make blueberry sauce. Place blueberries and lime juice in a small pot on medium heat. Bring to a simmer until juice is released from blueberries and sauce forms. Turn off heat and let cool. When cake and sauce have cooled slightly, pour sauce in the middle of the cake. Sprinkle coconut chips over the top and serve. Balsamic macerated strawberry yogurt cups are an easy and elegant snack, dessert or breakfast! Top creamy full fat yogurt with juicy ripe strawberries macerated in a mixture of balsamic vinegar and honey, then sprinkle with crunchy toasted almonds! It’s a healthy way to fuel between meals! Easter is less than a week away so I’m excited to be partnering with one of my favorite brands, Bob’s Red Mill, for a sweet treat that’s perfect for sharing this Sunday! I have a bit of a love/hate relationship with Easter. It all started off great because, you know, being a kid...candy…what could go wrong? Oh, only MY MOST TRAUMATIC CHILDHOOD MEMORY. Okay, so that’s a bit of an exaggeration, and considering I did wear big purple glasses through elementary school, you know I had many traumatic memories. The Great Easter Outfit Fail of 1991 began when my grandpa and his lady friend came to visit for the holiday and decided to gift me a new Easter outfit. By early 90s nostalgia standards, it was glorious. Matching floral print pants and shirt, but instead of normal pants, it was a pair of long stretchy shorts with a thick floral ruffle at the end, and instead of a normal shirt, it was a crop top, off the shoulder three-quarter sleeve top with, obviously, more floral ruffle on the sleeves. Being a gift, I was forced to wear it. Although in my parent’s defense, I had zero sense of style and there’s a strong possibility I thought I looked fabulous. It was until I arrived at our neighborhood clubhouse for their annual Easter egg hunt and saw my friends, in their cute and very normal Easter dresses I realized I looked like a huge dork. The other clue was when they burst into laughter at the sight of me. My memories after that are pretty fuzzy, probably buried in my subconscious, but I’m pretty sure there were tears involved. And I know there’s at least one picture of me holding my Easter basket with a huge pout, which is probably floating somewhere around the internet in meme form. Now that I know how to dress myself as an adult (#winning! ), I haven’t had any outfit related disasters. But being born on April 4th and getting married on March 31st, Easter always has a way of interfering with birthday or anniversary celebrations. And when it comes to birthday/anniversary vs. Easter, Jesus wins. Hopefully I don’t sound like too much of a Debbie Downer on Easter, because we really do have wonderful celebrations every year at my mother-in-law’s house. We still get Easter baskets because we are 30 going on 9. Except mine is always full of dark chocolate and cooking gadgets, as it should be. That Easter bunny knows me well! Then we all sit down to a delicious Southern meal, followed by a dessert we are way too stuffed to eat more than a few bites of! I made these Easter macaroons for that exact reason. After a day of candy and Easter ham and biscuits, no one is in the mood for a heavy dessert, but Easter without a cute spring inspired dessert would be a crime! These pastel macaroons will look so pretty as part of your Easter spread, and they have just a hint of sweet that’s perfect after a heavy meal. The whole batch has only ¼ cup sugar, relying on the natural sweetness of coconut. So here’s a macaroon question for you all. Why are there two very different types of cookies, both called macaroons? There’s the pure shredded coconut cookies then those very pretty and dainty filled macaroon cookies (which always disappoint me because they look much better than they taste). These obviously are a take on the former. I made these with a mixture of shredded coconut and Bob’s Red Mill almond flour to make them a bit lighter and more cookie-like. Bob’s Red Mill almond flour is my favorite brand of my favorite gluten free flour to bake with. It’s made with blanched, whole almonds so there’s no dark bits of skin then extra finely milled so it’s super soft. You can use it for lighter baked goods like cakes, pancakes and biscuits and it won’t have that grainy consistency you get with other almond flours/meals. Plus, being made with almonds, it's a rich source of vitamin E, manganese and monounsaturated fats. Grab a coupon for Bob's Red Mill here so you can try it yourself! 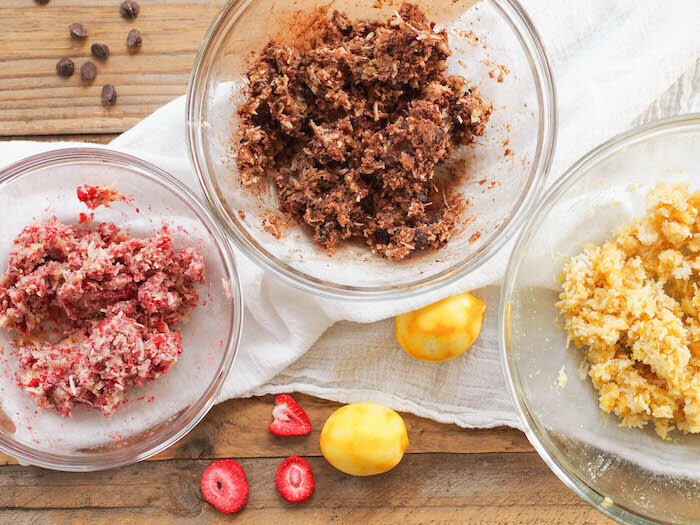 Feel free to experiment with different types of zest and freeze dried fruit to create a rainbow of colors. I think it would be cute to make a batch of all pastel macaroons with freeze dried blueberries, strawberries and mango! Just be careful not to let them overbrown or they’ll lose that pretty color – keep a close eye on them in the oven and you may want to check on them a few minutes before the end of baking. Preheat oven to 350 degrees. Line a baking sheet with parchment paper or grease with a little coconut oil. In a large bowl, mix coconut, almond flour and sugar. Add eggs and stir to combine. Divide dough evenly between four bowls. To make the lemon macaroons, stir in the lemon zest. To make the chocolate macaroons, stir in the dark chocolate, cocoa powder and almond milk. Add a little more almond milk if needed to combine. To make strawberry macaroons, place freeze fried fruit in a plastic bag. Crush with something heavy (I used a meat mallet) until it's a flour consistency. Add to dough with almond milk, adding more almond milk if needed. Scoop tablespoon sized dollops of dough evenly on the prepared baking sheet. Place in the oven and bake 20 minutes, checking a few minutes before it's supposed to be done to make sure it's not browning too much. Let cool on the baking sheet a few minutes then transfer to a wire rack to continue cooling. Store covered at room temperature a few days, then transfer to the refrigerator.